Www.eu-eela.org E-science grid facility for Europe and Latin America Marcelo Risk y Juan Francisco García Eijó Laboratorio de Sistemas Complejos Departamento. 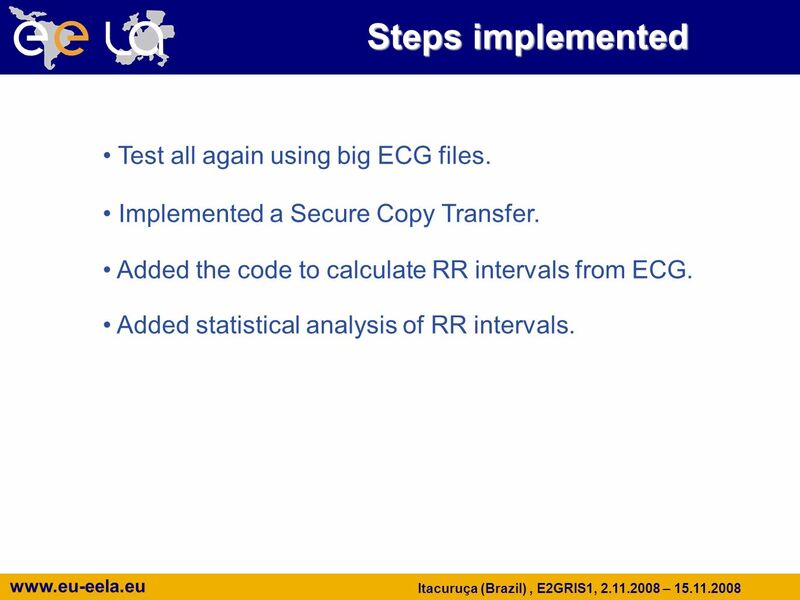 2 www.eu-eela.eu Itacuruça (Brazil), E2GRIS1, 2.11.2008 – 15.11.2008 Steps implemented Test all again using big ECG files. Implemented a Secure Copy Transfer. Added the code to calculate RR intervals from ECG. Added statistical analysis of RR intervals. 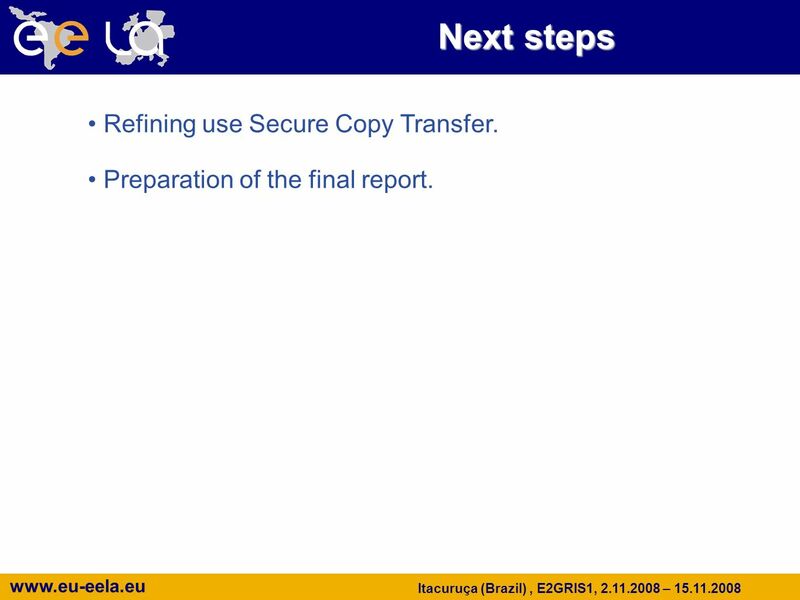 3 www.eu-eela.eu Itacuruça (Brazil), E2GRIS1, 2.11.2008 – 15.11.2008 Next steps Refining use Secure Copy Transfer. Preparation of the final report. 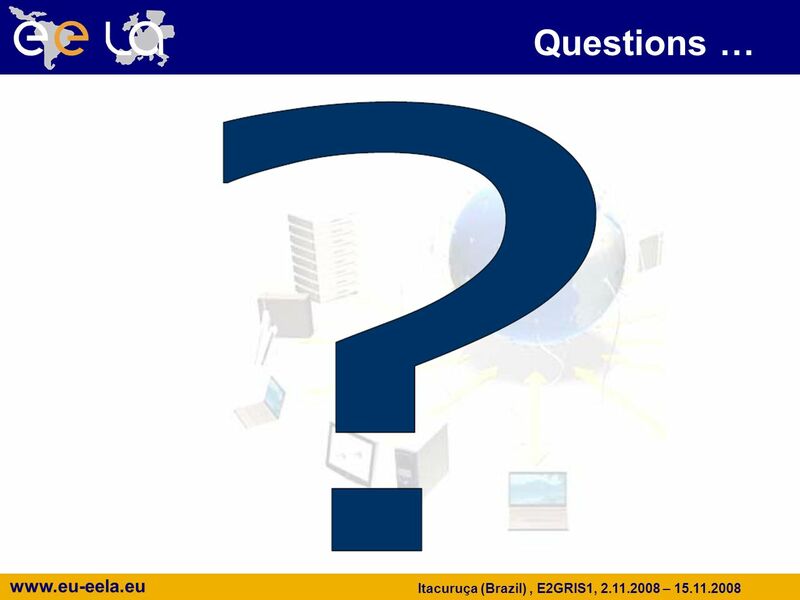 Download ppt "Www.eu-eela.org E-science grid facility for Europe and Latin America Marcelo Risk y Juan Francisco García Eijó Laboratorio de Sistemas Complejos Departamento." THE IANAS PROGRAM ON SCIENCE EDUCATION Report of activities Americas 4th to 6 th, May 2009 WASHINGTON José A. Lozano Coordinator IANAS SEP ACADEMIA COLOMBIANA. Empowering our people with science and its languages A Latin American perspective Julia Tagüeña Centro de Investigación en Energía Universidad Nacional. E-science grid facility for Europe and Latin America E2GRIS1 Jaime Parada, Edgar Perdomo – UCV Itacuruça (Brazil), 2-15 November 2008 CATIVIC. 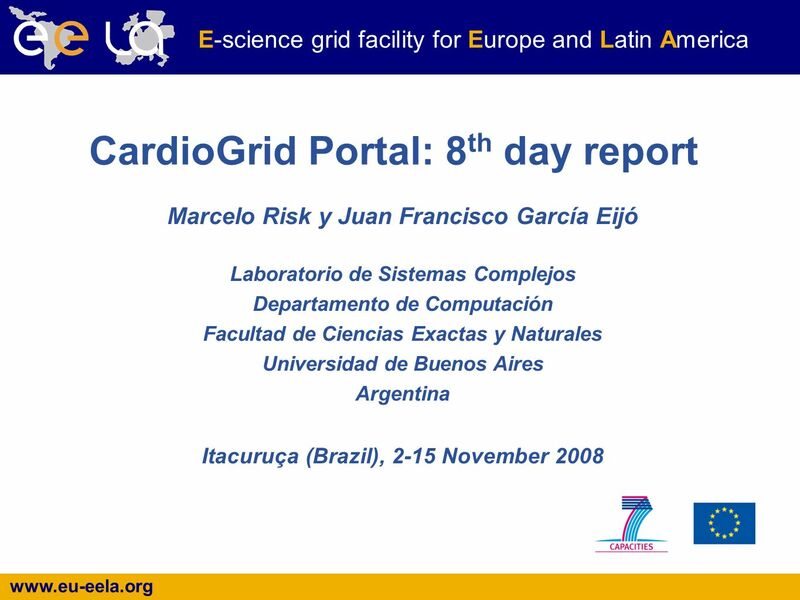 E-science grid facility for Europe and Latin America Marcelo Risk y Juan Francisco García Eijó Laboratorio de Sistemas Complejos Departamento. E-infrastructure shared between Europe and Latin America Education in the Grid Environment LEMDist J. Cruz, L. Enriquez, M. García, J.
Menéndez, Re & Kind Flood risk maps & salinity front FACULTAD DE INGENIERÍA UNIVERSIDAD DE BUENOS AIRES REGIONAL AIACC WORKSHOP Buenos Aires, Argentina. Grid Initiatives for e-Science virtual communities in Europe and Latin America WP4 - NGI / LGI Infrastructure Services STATUS REPORT. Grid Initiatives for e-Science virtual communities in Europe and Latin America WP6: Infrastructure & Application-oriented Services for. Grid Initiatives for e-Science virtual communities in Europe and Latin America THE GISELA PROJECT Long-term sustainability & VRC Support. ETD 2008 – Spreading the Light ETDs in Latin America: an overview. Integración de plataforma de e-learning y laboratorio remoto para la realización a distancia de prácticas experimentales reales en la educación tecnológica. Context-aware Generation of User Interface Containers for Mobile devices Francisco J. Martínez Ruiz 1,2, Jean Vanderdonckt 1 and Jaime Muñoz Arteaga 3. 1 Bogotá, EELA-2 1 st Conference, On the Co-existence of Service and Opportunistic Grids Francisco Brasileiro Universidade Federal. 12th EELA Tutorial, Lima, FP6−2004−Infrastructures−6-SSA E-infrastructure shared between Europe and Latin America. Stopping, straggling and inner-shell ionization within the shellwise local plasma approximation C. C. Montanari and J. E. Miraglia Instituto de Astronomía.